Never touch a dinosaur! You’ve been warned. It might run away, snort and stamp, or even bite you. Ouch! Remember: a dino isn’t a cat, so don’t pat. Pointy claws? Just hide indoors. 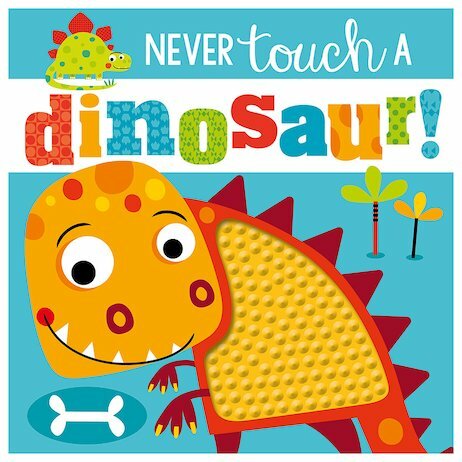 Oh, and do NOT stroke the spines on its back, unless you fancy becoming a dino snack! Yes, we know the dinos in this book look incredibly cute and friendly. But don’t touch them! Or actually, do. There is one place that it’s safe to touch a dino – and you’ve just found it. The cover of this book! Kids will love reading the advice – and then ignoring it! Dear Dinosaur: T. Rex on Tour. What Can You Stack on the Back of a Yak? Geronimo Stilton #12: Merry Christmas, Geronimo! Sink Your Teeth into Dinosaurs! There's a Spider in This Book!